"Water-wise" redirects here. For the UK-based water conservation group, see The Waterwise Project. Vitis tiliifolia is a New World liana in the grape family commonly known as Caribbean grape. Other names include West Indian grape, water vine, and (in Belizean Creole) water tie-tie and water-wise. Vitis tiliifolia is found throughout most of Mexico (including Baja Sur, Campeche, Chiapas, Colima, Durango, Guanajuato, Guerrero, Hidalgo, Jalisco, México, Michoacán, Morelos, Nayarit, Oaxaca, Puebla, Querétaro, Quintana Roo, San Luis Potosí, Sinaloa, Tabasco, Veracruz and Yucatán states) and in many other countries in the Americas and the Caribbean (Belize, Colombia, Costa Rica, Cuba, Dominican Republic, Ecuador, El Salvador, Guadeloupe, Guatemala, Haiti, Honduras, Jamaica, Nicaragua, Panama, Puerto Rico, U.S. Virgin Islands and St Lucia). 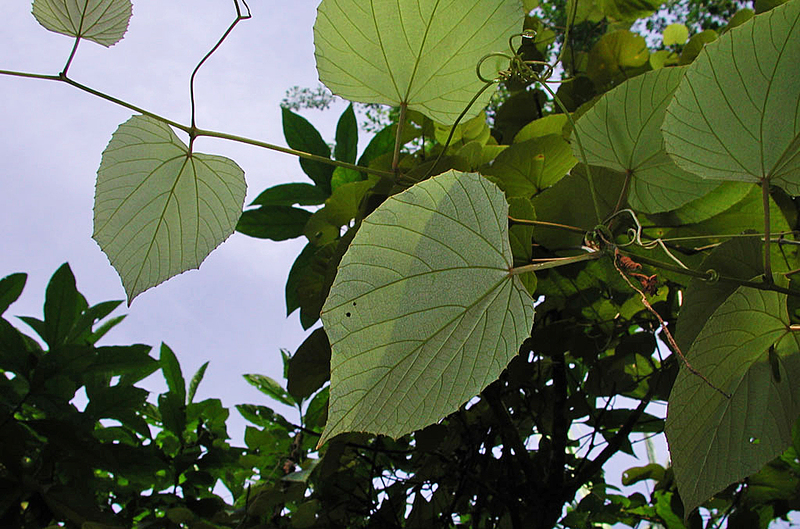 Vitis tiliifolia is grown as a forest crop in Mayan agriculture, and is used for food or drink, or as an ingredient in medicines. Vitis tiliifolia may have some resistance to Pierce's disease (PD), which afflicts many commercial grape species; it has exhibited atypical symptoms despite harboring high populations of the plant pathogen Xylella fastidiosa, which causes PD. ^ a b c d The original description of V. tiliifolia is found in Syst. veg. 5:320. 1819 "Vitis tiliifolia". Germplasm Resources Information Network (GRIN). Agricultural Research Service (ARS), United States Department of Agriculture (USDA). Retrieved April 20, 2010. ^ "Vitis tiliifolia". Natural Resources Conservation Service PLANTS Database. USDA. Retrieved 6 August 2015. ^ a b Waight, Marlyn (July 6, 2009). "Plant List". Forest Garden Database. Exploring Solutions Past: The Mayan Forest Alliance; El Pilar Maya Forest Garden Network. Retrieved April 20, 2010.